Copper engraved map of Lazio region, Italy's central-west coast with the city of Rome. Shows towns, villages, landmarks, mountains and rivers. Relief shown pictorially. First reworked edition of Mercator's Atlas Minor issued by the Janssonius heirs (Johannes Janssonius van Waesberge) in 1673, without text or printed index. With engraved architectural and emblematic title page, and 183 copperplate engraved maps. 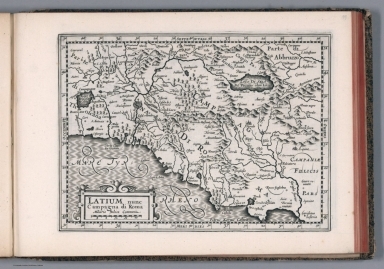 Printed from the plates of the Cloppenburg editions of the Atlas Minor (1630, 1632, 1636), with a new map of the United Provinces and additional decorative elements to some maps, along with some updates to the maps. This edition of Mercator's 'Atlas'... was a changed format edition. Its newly engraved maps fell in between the folio maps in the Mercator-Hondius Atlas and the Atlas Minor. The Cloppenburg edition seems to have been suppressed after 1636. It was continued with this copy after 1673 by the Janssonius heirs. Because the maps are all take from the Cloppenburg plates of the 1636 edition, these maps are dated 1636, while the atlas is dated (Pub Date) as 1673. The maps include decorative cartouches, latitudinal and longitudinal lines, coats of arms, compass rose, and show political boundaries, cities, towns, topography, vegetation, waterways and landmarks. Relief shown pictorially.